Botanical Name: 1. Ephedra sinica Stapf; 2. Ephedra equisetina Bunge; 3. Ephedra intermedia Schrenk et Mey. Part Used & Method for Pharmaceutical Preparations: Herbaceous twigs or stems are collected from the Beginning of Autumn (thirteenth solar term) to Frost's Descent (eighteenth solar term), dried in a shady place and then cut into pieces and used either raw or baked with honey. 1. Wind-cold type of exterior syndrome manifested as chills, fever, headache, general pain, nasal obstruction, absence of sweating, thin and white tongue coating and superficial and tense pulse. In such cases, Ephedra (Mahuang) is used with Cinnamon twigs (Guizhi) in the formula Mahuang Tang. 2. Cough and asthma due to invasion by exogenous wind and cold. 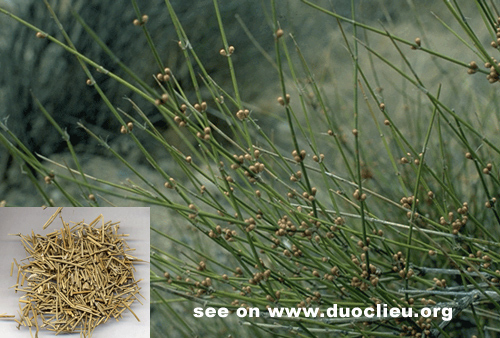 Ephedra (Mahuang) is used with Apricot seed (Xingren) in the formula Sanniu Tang. 3. Edema with exterior syndrome. This disease in traditional Chinese medicine is similar to acute nephritic edema in Western medicine. Ephedra (Mahuang) is used with Gypsum (Shigao) in the formula Yuepi Tang. Cautions & Contraindications: This herb causes heavy sweating. It should be used cautiously in deficiency conditions with sweating or asthma and cough due to failure of the kidneys in receiving qi.